PORTO ALEGRE: The Netherlands all but secured their place in the last 16 of the World Cup as they came from behind to beat Australia 3-2 in Porto Alegre on Wednesday. Arjen Robben fired the Dutch into an early lead, but a stunning volleyed equaliser from Tim Cahill and Mile Jedinak's penalty early in the second-half had put Australia on course for their most famous victory. Their joy was short-lived, though, as Robin van Persie levelled before Maty Ryan let Memphis Depay's long-range effort creep into the bottom corner to make it two wins from two games for the Dutch in Group B. "I just wanted the players to get the reward for the way they went about things today," said Australian coach Ange Postecoglou. "I have put a lot of pressure on the players and the staff that we are going to be a certain type of team and take it to world class opposition, but it is one thing saying it and another thing doing it. "They did that today but didn't get their reward. It's heartbreaking and massively disappointing." A change of formation at half-time helped turn the tide in the Netherlands' favour after the break, but boss Louis van Gaal admitted his side had been fortunate to escape unscathed after a lacklustre first 45 minutes. "If in the first-half you lose the ball so simply or so often, then the formation doesn't matter. I needed to change something at half-time to boost their confidence and change their mindset," said the newly appointed Manchester United manager. "Fortunately it turned out ok, but it could have turned out differently. In the second-half we had more chances and the way the players came from behind was incredible. To recover and correct that situation showed a lot of mental strength." The Dutch will be certain of a place in the next round should Spain fail to beat Chile later on Wednesday while Australia are staring at almost certain elimination. 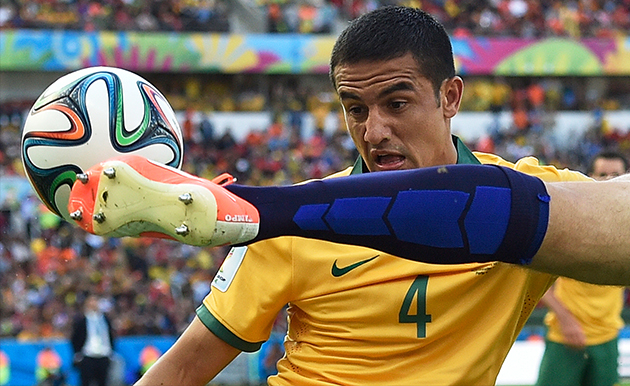 Australia will face champions Spain in their last match but will have to do without Cahill as he saw his second yellow card of the tournament, whilst Van Persie will miss his side's clash with Chile after also being booked. 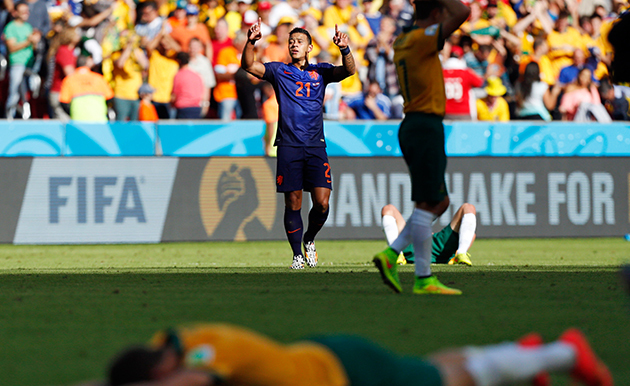 Australia had never been beaten in three previous friendly meetings with the Netherlands, and were forced to come from behind when Robben galloped through the Australian half almost unchallenged before rifling home his third goal of the tournament. The lead lasted barely a minute, though, as the Socceroos levelled in style when Cahill caught a deep cross flush on the volley to send the ball crashing in off the bar in a goal reminiscent of Marco van Basten's legendary strike for the Dutch in the 1988 European Championships final. Australia then went on to control the rest of the half and had two great chances to go in front. Firstly Mark Bresciano blasted over when well-placed inside the area before Matthew Spiranovic failed to make a clean contact from close range as a free-kick fell at his feet. Cahill was booked for a rash challenge on Bruno Martins Indi that forced the Dutch centre-back off on a stretcher, with Depay replacing the Feyenoord man. Australia continued to press at the start of the second-half and had a goal ruled out within 60 seconds of the restart for a push by Matthew Leckie on Daley Blind. Van Persie then saw his second yellow card of the tournament when he clashed with Spiranovic. And things got even worse for the Dutch moments later when Daryl Janmaat was adjudged to have handled substitute Oliver Bozanic's cross and Jedinak stepped up to convert from the penalty spot to put Australia in front. Again, though, the lead was short lived as poor defending from Jason Davidson allowed Van Persie to spring the offside trap and thunder his third goal of the tournament high into the net. The game then turned in 60 seconds midway through the second-half as Leckie's chested effort from Tommy Oar's cross was smothered on the line by Jasper Cillessen and at the other end Ryan let Depay's long-range effort slip through his grasp to hand the Netherlands all three points.